Developer: D3Publisher of America, Inc. The Eldrazi have risen and the oaths have been taken! Summon your courage and best deck to take on the endless hordes of Eldrazi in Oath of the Gatewatch; now live in Magic: The Gathering - Puzzle Quest! 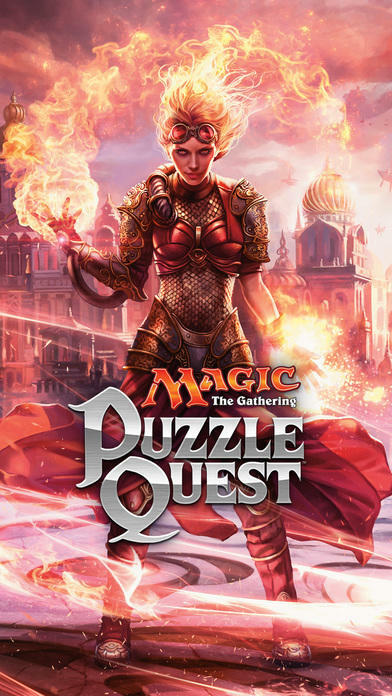 Magic: The Gathering - Puzzle Quest combines the acclaimed card game with the original match-3 RPG to bring the Multiverse to life! Build the ultimate deck, recruit powerful Planeswalkers and gather mana to unleash spells and creatures on your opponents in competitive PVP, events and more! All new weekly Events and competitive asynchronous PVP matches await! Play against other’s decks and win awesome new rewards including mythic and rare cards from the latest sets! Master each of the five mana colors to become the ultimate player and battle others for even better prizes! Test your skills as you craft the perfect deck and climb to the top of the leaderboards in competitive asynchronous player-versus-player puzzle combat! Prepare and strategize what creatures and spells are needed to overcome an ever-growing collection of single player challenges. Build a worthy deck and battle some of Magic: The Gathering’s most deadly forces. 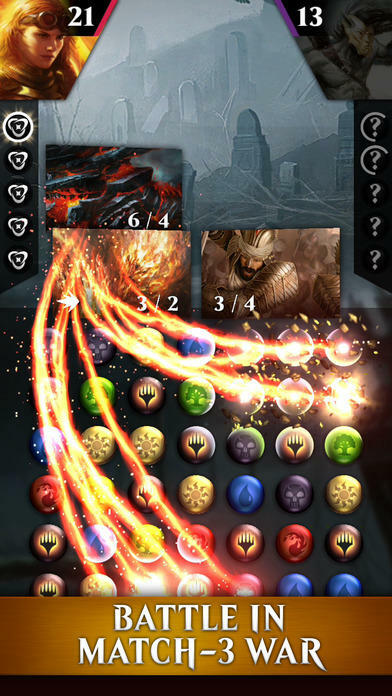 Powerful spells such as Tragic Arrogance or ferocious creatures like Avaricious Dragon await combat on the match-3 battlefield. Discover new mechanics like Devoid and Ingest and develop new strategies to win matches! Choose the most powerful Planeswalkers in the Multiverse and build a deck worthy of these formidable mages. Stay several steps ahead of your enemy with Jace, the master of deception or unleash the pyromantic fury of Chandra, the fire mage. Recruit new Planeswalkers like the malevolent Ob Nixilis or two colored mages like the Master of the Depths, Kiora or Sarkhan the Mad. 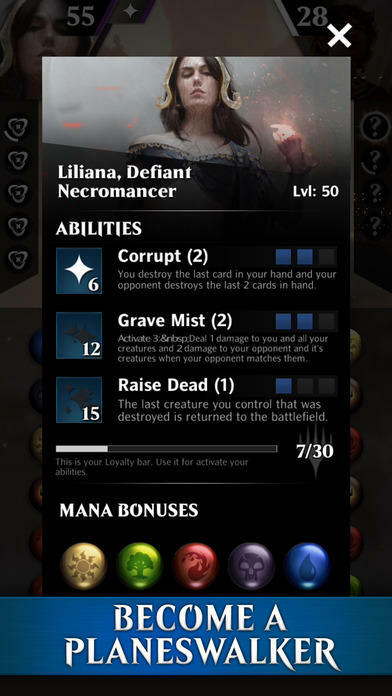 Use your Planeswalker’s unique abilities like Chandra’s Flameshot to annihilate your enemies, or Liliana’s Necromancy to raise the dead. Level up your Planeswalker and spells to crush your foes. 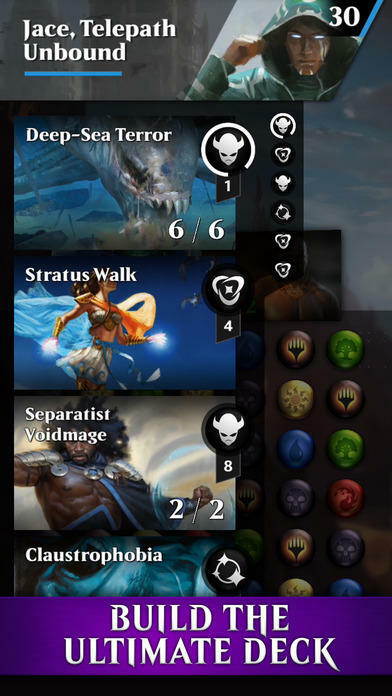 •	Now with decks from Oath of the Gatewatch and Battle for Zendikar. Card sets updated regularly. •	Create powerful decks and new strategies to defeat your opponents. •	Experience deep RPG leveling and make your Planeswalker’s abilities even more powerful. •	Snag the top ranks in PVP matches, quick battles and events to win top rewards. •	Master each of the five colors to gain better rewards in PVP and Event tournaments. 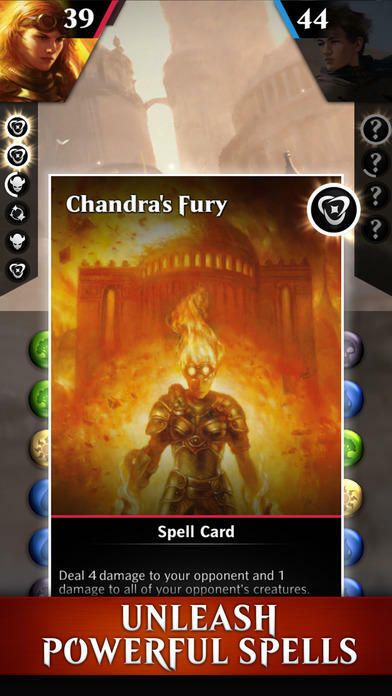 New Events - 1 new Daily Event, Planeswalker themed events and more! For full update notes in English, please visit d3go.com.